Here is the first installment of “The Latest” for Michael Conniff’s Community (MC2 ), meant to update my friends and fans with content hot off the presses. If you don’t think writing can be taught then you should read this book. If you do think writing can be taught then you too should read this book. Either way, keep this in mind as you read: WRITE GOOD! is the by-product and end product of countless hours watching my writing students make the same mistakes, over and over again, while I tried to explain these rules born of tens of thousands of hours of writing. I have written this book for the greater good of humanity but also so I would never have to explain the rules again. I wrote it selfishly to create shortcuts in my own teaching. Now, for example, when a student quotes two different speakers in the same paragraph, I just say “#4” and leave it at that. When they begin a sentence with “There is”—I mutter “#15” and go back to the game I am watching on the black box. And when they can’t tell the difference between a dash and a hyphen, I wittily opine “#8 and #9” and return to my afternoon nap. 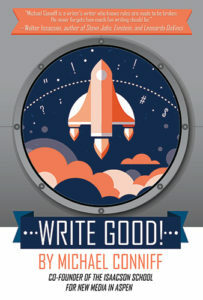 WRITE GOOD! is not meant to be definitive or exhaustive but exists for a more quotidian purpose: to eliminate the most common mistakes in writing. I hope you will read it, learn it, and then forget it so nothing gets in the way of your words again. This slim tome is served up by the author in honor of the sine qua non of slim how-to writing books, THE ELEMENTS OF STYLE by E. B. White—the late, great essayist and children’s book writer—and his late and equally great Cornell professor, William Strunk Jr. Read that book first and then read it over every year and you won’t go far wrong, not even when you need to disagree. As for the rest of the story: this ain’t rocket science because in rocket science you can’t use words like ain’t unless you fire a tin can into outer space from your own backyard. In writing on terra firma you can literally do whatever you want without being sent to the moon. Rules are made for the breaking with one unbreakable warning: you have to know when you are breaking a rule. As any jazz musician will tell you: to play outside you first must learn how to play inside. Once the right notes are under your fingers, you can learn to play the wrong ones like Thelonius Monk and be declared a genius not of this world for so doing. The problem is nobody likes rules, especially not in writing. Just about every writer (you and me both) absolutely hates rules. Writing and the internet want to be free, but in the real world if you write without rules, you enter a black hole with no escape. So break whatever rule you want as long as you know the rule you are breaking. The good news is we already have many rules of writing imbedded within our DNA. When is a question mark a question mark? When you put it at the end of a question like I just did. That’s a rule everyone knows and follows. We all know a question mark means a question, that a period signals the end of a sentence. We all capitalize to start a new sentence, and everyone hits the return key to start a new paragraph that is invariably indented. Those rules are made to (almost) never be broken. Once you know the rules, they become your best friend because they lose their power to confound. How can that be? Simple: once rules commingle with your writing DNA they vanish—you use them in the real world of page and screen without ever thinking twice about it. The rules no longer slow you down, any more than a cloud on the horizon can keep you from your destination here on earth. Our goal herein is to learn to internalize a handful of critical rules so we can more or less forget them in the act of writing—so they become second-nature whenever (and whatever) you write. Once implanted in your cerebral cortex, these rules will disappear just as stitches miraculously vanish after surgery that time you fell from out of nowhere. And then the real writing can begin. We begin our book on writing with a wink-wink because we know the title is as ungrammatical as it gets. Any elementary teacher across the fruited plain will gladly tell you, much too officiously, that WRITING WELL! is a mo’ better (more grammatical) way to say much the same thing. They would tell you WRITING GOOD! is just plain bad. A classic tome by William Zissner, called “On Writing Well,” has passed its 30th Anniversary edition with no signs of abeyance or abatement. Zissner too evokes Strunk and White in his first sentence and hence can do no wrong. But if Writing Well is a good thing, then Writing Good! is even better. I don’t want you to write well. I want you to write good starting with the very first rule of writing. Our excursion into rule-learning thus begins unequivocally with the most important rule of all.